Briefcase Purse with Real Working Phone. 1970s. 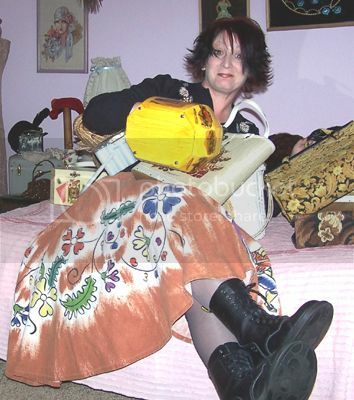 Maker unknown, but likely Dallas Handbags. 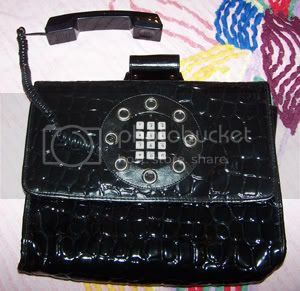 Black faux alligator bag with pushbuttons, giant grommets to resemble an old-fashioned phone dial, black plastic handset and a wire inside to connect it to a phone jack. The handset fits inside the handle on top and there’s a detachable strap (not pictured). The most desirable of these handbags are the red ones, but I was lucky enough to score this black one for a fairly reasonable price. Completely unrelated side story: My husband, a telecommunications contractor, owned one of the first cellular phones in the mid-1980s. It was huge and heavy and came in a hard-sided briefcase. We had a friend in the mobile phone business, so he sold it to us "wholesale." I cried when I wrote out the check for $1,350. I'll never forget the amount—it was more than our mortgage payment! This is one of my more recent purchases. 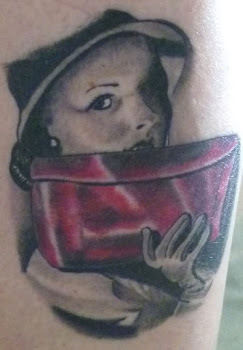 I guess it's good that I took a year off from this blog... during that time, I definitely added to my collection! 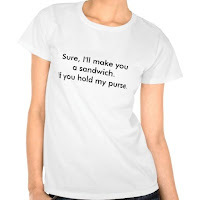 This bag is so cool! Enjoyed your story also. Just amazing. Wonder how long it will be before the iPurse! ha!